Resolution to remove fed from ESEA has passed committee. Hoping, with elections to keep focus on right things. Albany—Skelos down, replacement John Flanagan. Mulgrew says Flanagan understands education but that doesn’t mean he’ll do the right thing. Financial backing comes from people unfriendly to teachers, favors charters. Learning Summit—Mulgrew testified on evaluation law. Says changes not good for ed., we need stability and something simplified. Says some districts want lesson plans used for ratings, but UFT wants to maintain local bargaining and control. Says we want ranges so we can make local decisions. Matrix—Misunderstood. For first time, if MOSL effective or developing, teacher can’t be rated ineffective. Says it will work for us until we can change federal law. Says state believes admin in cahoots with teachers and that’s what they act on. Says UFT is smart and tactical, and that we wanted this out of hands of legislature, which wanted minimum number of ineffective ratings. Says student proficiency ought not to be equated with teacher ratings. Says he hopes Regents will change this as they are not advisory, but rather regulatory. Says if they vote no APPR must be revisited. UFT wants something uncomplicated, wants to form committee to continue to look at APPR. Says it is in flux, if federal law changed we will push to change state law as well. City Report—Renewal Schools—SED has to set metrics on what is considered demonstrable growth. We have a lot of work to do, and these schools are the neediest. Plans are preliminary and subject to change. New mayor wants to help rather than close schools. Says we need to examine data to increase grad rates and plan. Teacher’s Choice—Big push from UFT. Using stories of out of pocket for social media campaign. Says we did great job on budget last year. Urges members to visit City Council members and lobby. Survey—74% of respondents want to continue with workday schedule. Signed one year agreement and will continue to monitor PD. Paperwork—UFT demands new paperwork standards, and continues to create them. There are papers at DA explaining them. Asks for conversations at schools, and wants issues sent to DRs. Blames principals. Spring Conference—urges attendance, concludes report. Arbitration—Classes have been taught after school with up to 90 students. Arbitrator ruled against. All people who were paid per session will now get pro rata rate. Mary Ahern—we want our union to stand up for us—we shouldn’t agree to things and worry about it later. How can UFT agree to higher % for independent eval. than NYSUT. Mulgrew says everyone always says everyone will be rated ineffective with new plans, but there are fewer bad ratings each year. He now claims they moved legislature NOT to have minimum of bad ratings. Praises UFT for lowering Cuomo’s rating. He says we propose ranges so we can negotiate locally. He says we have wider range to negotiate via local collective bargaining. Says it will entice SED. Says we are doing work in a very difficult political environment. Says we keep pushing back, don’t lose our cool, and are very smart about how we do things. Mulgrew happy we had “less poorly rated teachers,” but fails to mention high stakes attached to current low ratings. Praises social media campaign again. Says it is worst time to be an educator but sees light at end of tunnel. Says to think and be smart. CL PS 110—recertification process for prof. and permanent license. Mulgrew says it’s not clear how it’s going forward. Mulgrew speaks of ridiculousness of having new eval. system in November, with 25% of school year gone. Will be 100 hours, but question is which hours qualify. Peter Cohen CL PS 163—UFT does great job defending CLS rated ineffective. U-rated CLs in pre-K get S or U. Asks for expedited process. Mulgrew says he will push it if they want it. Q—Can admin ask for extra things on unit plans? A—No. That is what we negotiated. Dan Lupkin, CL—Why is wider range better to negotiate in? With wider range, it signals you are willing to negotiate. Strategic decision to get overall goal done. Mulgrew amused by rumors about everything he does. Megan Moskop—motion for next month, HS sports for all. Ss have been running campaign for equity in HS sports. David Garcia Rosen fights for his students to have sports. Teams were not given back to small schools. Garcia facing disciplinary action for activities. Says all kids need exercise and sports. Applause. 38,000 HS students have no spring sports, concentrated in small schools in high needs areas. James Vasquez asks whether res brought up to social justice committee It was not..
Sterling Roberson—to oppose Cuomo tax credit. Will benefit wealthy and harm public schools. We don’t begrudge anyone options, but object to taxpayer subsidies. State still owes billions in CFE funds. Asks UFT to vigorously oppose this. Evelyn de Jesus—says original vision of charter was one of collaboration, but many don’t follow laws or have transparency. Opposes increase in cap of charter schools. 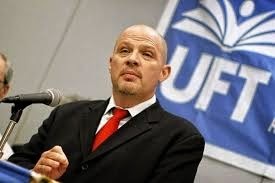 UFT will continue to lobby to maintain cap, and will demand charters enroll special ed. and ELL students. Janella Hinds—supports unit costing for DOE. We’ve seen destruction of community schools.We’ve seen educators ripped from schools and placed in smaller schools. Many teachers languish in ATR. Budgeting based on member salary. UFT should demand a shift in budgeting to unit-based rather than salary based. Amendment to add language about racism in ATR is defeated. Tom Brown—supports UFT participation in Gay Pride Parade Sunday June 28th. Mulgrew speaks of Fredricks court case that would render all US RTW. Emil P.—supports resolution toward single payer health insurance in NY State. Would end for-profit insurance, save millions. Emil P.—Resolution defending Planned Parenthood against GOP attacks. Asks UFT to let legislators and NYSUT to support. Lauren Cohen—amendment to strike word “Republican” from attacks. Should focus on issues, not parties. Michael Schulman speaks against amendment. Says attacks not coming from Democrats. Janella Hinds says we need to speak about gridlock, and supports amendment. Tom Brown—supports resolution to protect Social Security and Medicare as earned benefits. Amendment about imperialist governments, war budgets and poor UFT record. Sterling Roberson opposes.